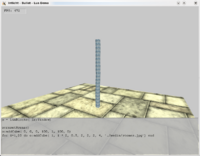 This is a small test application using c++, Irrlicht 3d engine, the bullet physics engine and lua. You can shoot cubes onto a plain surface and watch them collide. You will need the Irrlicht library to compile the sample program, you can get it on the Irrlicht homepage. After this you have to set the right library path in the CMakeLists.txt file. Download and install CMake. Check that cmake is in your PATH, if not add it. cmake -g "Visual Studio 8 2005" ..\. Then open the solution within your visual studio and build it. With -g you can specify a lot of different generators(mingw, codeblocks, ...), for more help run cmake.exe or check the documentation. Here is a link to a binary distribution from 11 May 2010. This page was last modified on 11 May 2010, at 12:28. This page has been accessed 53,286 times.